Oh how happy I am. Sorry, was. 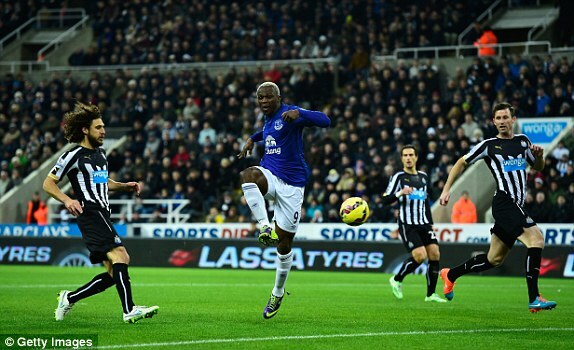 Kone started, and he scored…. What a joyous time to see a man, much derided for his short Everton pre-injury career in demonstrating his inability to hit the proverbial cow’s arse with the equally proverbial banjo, play an impressive hour as a starting centre forward, and within 5 of those 60 minutes he’d notched his first goal for the Club. And a hell of a team goal too, much like watching Everton but 9 months ago (remember those days?) – through ball to overlapping full back, pinpoint cross, back of the net. First class. I’m so pleased for Kone, and let’s give Martinez some credit, that if Kone can keep playing and scoring like that, he’ll more than justify his decision to bring him to our great Club. The contrast, I have to say, to when Lukaku came on, who looked lumpen and unfit, was stark, and not a little worrying. Mourinho might well be feeling even smugger than usual when he checks again…..yes, £28m……Blimey. Time to prove the doubters wrong Rom. We know you’re top drawer mate, now show us – again. Anyway, enough. This was as different an Everton team as you’ll have seen in a while. Seven changes from the Stoke debacle, some enforced, some to try and keep players fresh, and perhaps some to try something different. And it worked. Sort of. We didn’t look half bad. Ok, that’s a glass-half-empty description, but after what we’ve witnessed in most of December, and not a little bit of November too, the attitude and performance was an improvement, if not something to get overly excited about. But you’d have to say it was better than the brawl we’d tried to win not 48 hours beforehand. But we still lost, so it only sort-of-worked, not completely-worked. Robles didn’t look too bad (half-empty again, soz), apart from the odd flap and a punch when a catch would have been nice. Garbutt looked the part, and he seemed to interchange with Baines, so we didn’t always have the same left back, and Baines further forward, and more central on occasions, looked pretty good too. What Oviedo-baby thought looking on from the bench, we can only wonder. Luke’s much vaunted dead ball delivery was not as it was against Krasnodar, but let’s just say that he’s a work in progress, and still much to learn. I’d be happy to see him get a run in the team now, maybe even at the expense of Baines. Yes, I did just say that. McCarthy’s energy makes such a difference as well, and we need him back fully fit, as we noticed when he’d gone at half time. His replacement, Barkley, was guilty of just one of the three individual errors that once more blighted our defensive rigour, and caused us to lose again. There are only 6 teams who’ve scored more than Everton, but worryingly only 1 that has conceded more, and 3 of those goals QPR conceded were scored by us. It isn’t enough to just say “we need to stop making individual errors”. Of course we do. That’s like saying “we need to eat or we’ll die”. It’s blindingly obvious, but it’ll only happen if we do things differently, not just wishing it not to be happening. Don’t put Barkley on to do a job he doesn’t like to do, even if he did do it reasonably well in one game (QPR). Play him centrally, and further up the pitch. If you have to take off one Duracell Bunny in McCarthy, replace him with at least an Energiser Bunny in Besic (other Bunnies are available), even if he has been a bit poorly after over-doing the turkey. It’s only 45 mins for God’s sake, and if you’re fit enough to be on the bench, then you’re fit enough to play; you’re not there just to be decorative. As with Stoke, a curious refereeing decision (or non-decision in this case) may well have been pivotal. When you’re winning 1-0, and their main striker has not one, but three attempts to fell his marker, it is rather odd that there isn’t even a free kick, let alone the obvious red that should have ensued. But of course, such is our luck, that same man then equalises a few minutes later. Who knows what would have happened if Cisse had been sent off? We may have lost 5-1, but we may just have been able to win against a 10 man team that would have had to have come at us to try and at least equalise, and would have hence played to our strengths rather than our weaknesses (also known as “just stick it in to their box and they’ll give us a knock down or something”). But as I said against Stoke, we can lament all we like, and we can’t just rely on blaming an official or two, we need to make it irrelevant by playing better football and winning in spite of the decisions, not wishing the decisions to have been different. We move on. Luck has it that a team fighting with us (yes, us) for survival, has a home defeat against a fellow struggler, and then has the chance to put it right straight away against a weakened Everton. If you believe in patterns, this isn’t good news, but if you had a chance to put at least half right all the wrongs of the last two games, you’d probably prefer to play away than amidst the bloody stupid booing and the tension at Goodison, and you’d pick Hull rather than a top 4 team (that delight is just around the corner chaps). Our support at the other end of the M62 will be amazing, let’s make it loud and very proud, and let’s get behind a team that showed us yesterday that they do have the stomach for a fight, that they do possess a shed-load of ability, and that they do possess an ability to stick the ball in the net; and, whisper it, they even showed that they have an ability to play the game in a different way. And in Kone, we might just have an Everton No9 as evidenced by more than just his shirt number. Please Everton. New Year New You.